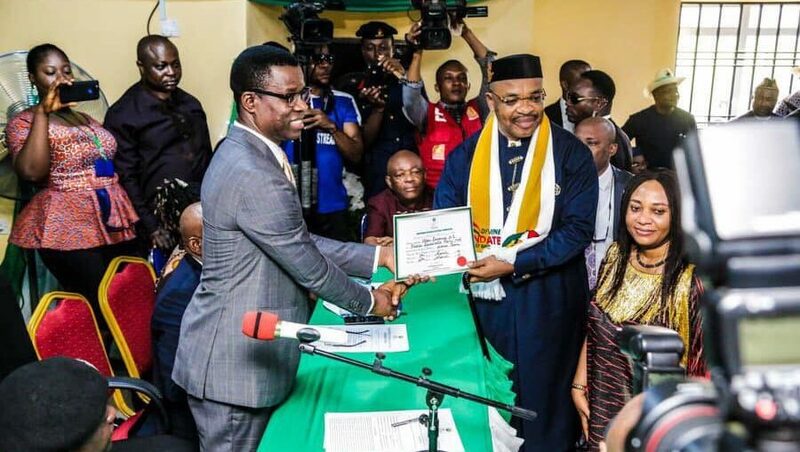 Governor, Mr Udom Emmanuel Of Akwa Ibom State, on Thursday, received Certificate of Return as the democratically reelected Governor on the platform of the Peoples Democratic Party (PDP). The Certificate of Return was presented by the Independent National Electoral Commission (INEC) at the INEC Office, Uyo, presided over by the Resident Electoral Commissioner in the State, Barr. Mike Igini. Speaking after receiving the certificate, Governor Emmanuel thanked Akwa Ibom people for the show of love bestowed on him by voting massively to ensure his victory in the recently concluded governorship polls in the state. He said “Akwa Ibom people showed me love in a way I least expected. This is a call to duty. We will serve our people with all our strengths, resources, might and everything God has given us. This is not the time for self-aggrandizement, but a time to explore that which God has bestowed on us to ensure Akwa Ibom is a shining light not only in Nigeria but the entire Africa. Rededicating the victory which he said is a victory of light over darkness, unity over disunity, and victory of good over evil, to God Almighty and the people of Akwa Ibom, Governor Emmanuel pledged total loyalty to the service of the people, and reassured of continued peace in the state, adding that nothing will divide the state any longer. The State Executive spoke glowingly of the REC in the State, saying “I have seen several elections in this country, and the election under the watch of Barr. Mike Igini in Akwa Ibom State is one of the best and most credible elections in Nigeria. “The whole world knows who he is and what he stands for, but what surprised me most is that even those who benefited most from his integrity and transparency at his stretch of leadership, are the ones turning around to demonise the same person. But his image, character and integrity, rather than being dented, he is one of the best ever produced in this country. In his speech during the presentation, the state REC, Barr. Mike Igini, thanked the management and the entire staff INEC, NYSC members, etc who worked tirelessly as custodians and implementers of the vision and mission of INEC, as well as interfaced directly with the voters in all the Polling Units of the State that delivered the historical democratic experience. In his words: “How time flies, and how did we get to where we are today by giving out certificates of return? It is precisely 1 year, 6 months and 23 days that l have spent in Akwa Ibom state. On my arrival to this state on the 5th of September, 2017 the political parties chairmen/secretaries were the very first stakeholder groups that l met and l unveiled a mission to conduct a free, fair and credible election by providing equal opportunity to all parties. “They regaled their past experiences and dissatisfaction over how elections have been conducted in this state and sought to know if the 2019 election would be different. l made an unequivocal commitment that, under God in this state, in 2019, the General elections would be conducted and that ballot papers and result sheets would be delivered to every polling unit, to be audited by party agents before the commencement of the poll. “At a general meeting of staff, l shared the thoughts, the anger, frustration and disappointment of the people over the history of elections in this state where results are written before the votes are cast. I enjoined staff on the urgent need to restore hope and rekindle confidence in the sanctity of the ballot as the best means of expressing the democratic will of the people on who leads in a democracy. “We began the process of preparing the state for a transparent free, fair and credible election with the re-location with effect from 8th August 2018; a total of twenty-two (22) polling units hitherto in private premises and homes, to public places accessible to voters and urged all political parties and would-be candidates to prepare for real elections. “I embarked on the campaign that credible elections will be conducted in this state come 2019, but many dismissed my message of free, fair and credible election and had other plans of winning elections, while others took my message seriously and took their case to the electorate who only can confer authority on contestants. Today, we now know better those who took our promise of integrity driven electoral process seriously,” he stated. It would be recalled that Barr. Igini had pledged commitment to ensuring that INEC under his watch in the state would not be a tool of manipulation for electoral victory but a national institution committed to the conduct of free, fair and credible elections in Nigeria. He described as untrue the many allegations and lies by a number of politicians who commenced the campaign for his redeployment backed, that APC will not be allowed to win election in Akwa lbom; that he has compromised with the PDP without stating the particulars of compromise; and that he held meetings with some notable politicians at Eket without stating the date and time. Other allegations were that he delivered uncollected Permanent Voter Cards (PVCs) to the state Government without giving details when and quantity; that the house he lived in Lagos long before his re-appointment in August 21st 2017 was purchased for him by the state government; that he recruited card-carrying members of political parties as collation officer; that his body language would not allow for a level-playing field; and that INEC was planning to destroy election materials because of tribunal. The REC however charged politicians to stand tall and mighty in defense of democracy and the rule of law, because Democracy will not thrive in the soil of absolutism, adding that sustainable democracy cannot thrive without democrats who have imbibed pristine democratic values. In his remarks, the State Chairman of Inter-Party Advisory Council (IPAC), Pastor Ekomobong Akpan, stated that the Akwa Ibom people were always confident in Barr. Mike Igini as a man of unparalleled integrity, and knew that a paradigm shift was going to be witnessed in the State, knowing that with him at the helms of affair in Akwa Ibom, election would be free and fair, and that was what was witnessed during the elections. Governor Emmanuel, on his return after receiving the Certificate of Return, stopped at the Ibom Plaza to share the joy of the victory with the people of the Plaza Community.